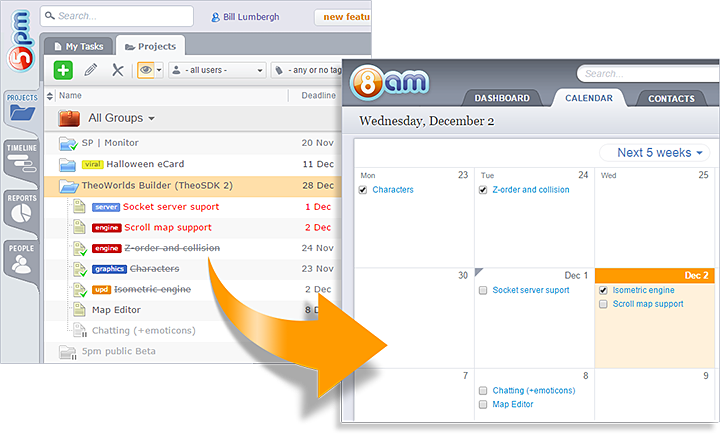 5pm is a project management tool that can compliment 8am. You can display 5pm tasks in 8am calendar view — drag them around to change the deadline, edit, mark as done, etc. You can import 5pm Client users as Contacts into 8am. This way you can use 8am for general contact management — add notes to them, files, assign small tasks and events (calls, meetings, even recurring ones), while 5pm can be used to track the projects for those clients.